Four oversized tales that will rock the Avengers' world! First, Jim Starlin and Ron Lim return to Thanos! Learn how a devastating defeat in Thanos' past will soon redefine the Marvel Universe, as the Mad Titan faces Mephisto, his future self, the Avengers and more! Then, can the Uncanny Avengers survive the wrath of an unleashed Spirit of Vengeance, and the all-new, all-creepy Avengers of the Supernatural? Meanwhile, when Doctor Strange is called upon to fulfill an old debt to an enclave of Himalayan technomonks, even the good doctor may be beyond his limits! A fairly disappointing collection, the only story that I felt worth reading is the story from the Thanos Annual, where we meet Thanos sometime both before and during the Infinity Gauntlet event. The art in the Doctor Strange story from the New Avengers Annual is so distorted and jumbled that I wasn't even able to read it. Ended up skipping that story altogether. 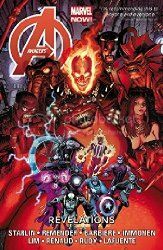 The Mojo story in the Uncanny Avengers Annual is OK, a typical Mojo/Mojoverse story (even though he is typically an X-Men villain - it's clearly evident that the Avengers are the golden children of Marvel now and can hijack any characters they want now, regardless of where they originated from). The Avengers Annual is a jumbled mess, and another story that I skipped right over. Overall, yet another disappointing collection from Marvel. I think I'm going to be just sticking to the main series from now on; these add-on series just never even remotely live up to their hype or potential. Despite the title of the collection, the only revelation going on here was that I didn't need to pick this up at all.